Officially it was not "Whalers Night", but throughout the TD Garden Tuesday night, it was 1997 all over again. That was the last season the Whalers played in Hartford before moving to North Carolina. 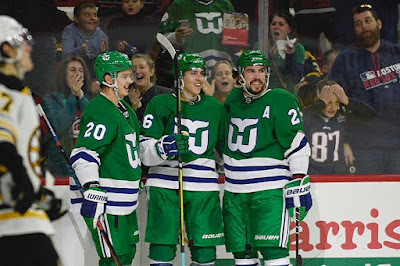 But a decision this season by the Carolina Hurricanes to hold a "Whalers Night" in Raleigh featuring vintage Hartford Whalers jerseys followed by a game in Boston to again wear the famous Whalers green allowed fans to unofficially declare Tuesday Night in Boston their own "Whalers Night". For New England hockey fans, it was something special. Hearing chants of "lets go Whalers", a following of faithful fans making the trip from Connecticut wearing Whalers green, and a very rare opportunity to see the Bruins once again wearing their white jerseys at home made for a unique atmosphere at TD Garden. Since the 2003-04 season, National Hockey League teams typically have worn white jerseys only on the road, with the exception of certain situations. 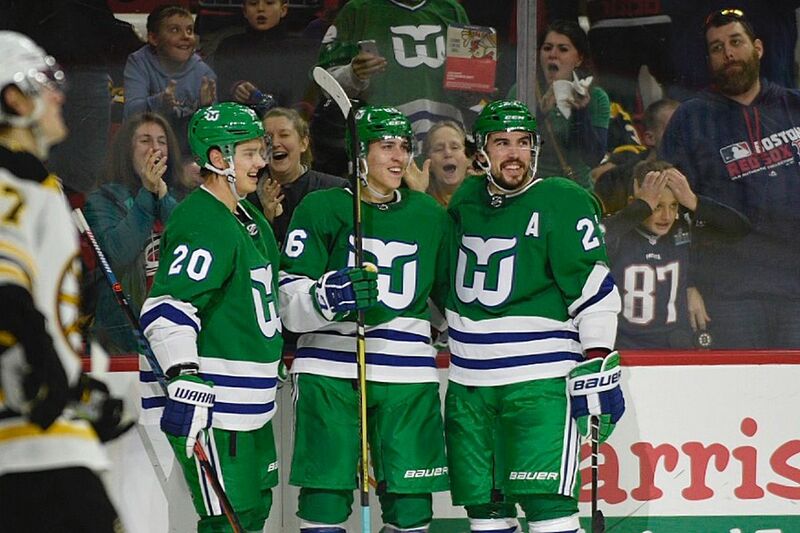 Tuesday night was not only reminiscent of seeing the Bruins in their traditional white home jerseys, but also gave fans an image they have not seen in 21 years - Whalers green on Boston's home ice. Tuesday night was an occasion seldom seen in sports - a "promotion" during an away game. The Hurricanes franchise deserves credit for paying homage to a historic New England rivalry, and even doing so while not on home ice. After a 4-3 overtime win for the Bruins, Tuesday night brought out the best in hockey. A game that had the feeling of 1997, paying tribute to 18 years of an intense regional rivalry, but also showcasing the exciting brand of modern hockey we see today. Had this game been played the last time the Whalers existed, the game would have been played with 5 skaters during overtime instead of the 3 skaters per team now used, a rule that has been enacted to increase goals during overtime. Anyway you want to put it, Tuesday night was an exciting night for hockey fans. A night only made possible by a Carolina franchise bringing back the sight of a classic, special New England rivalry. When the start of the 2018-19 National Hockey League season came around, I was very skeptical. I was worried that watching Bruins games with four extra "in-ice advertisements" would begin to resemble a lower-level minor league game, but I quickly realized how wrong I was. The NHL, unsurprisingly, did an excellent job working these ads into the ice (I'm still not sure why they're not called "on-ice ads", but that's another story. The four additional ads have been worked in well to the TD Garden ice, and to all ice surfaces throughout the league. In April 2018, the NHL announced that starting with the current 2018-19 season, all teams will be allowed to have four new positions for in-ice advertising. These positions have been located in the corners of the rink. Up to last season, all teams could and did sell up to four in-ice ads near neutral zone face-off dots. The original four ads were allowed to up to 81 square feet per advertisement, while four new ads are allowed to be up to 44 square feet each. Watching the Bruins games all season long, the new ads have blended in, and are starting to feel normal. They don't jump out at the viewer, and being in the corners, its easier to forget they are even there. Had the ads been placed in the offensive zones, like seen in some lower-level leagues, this would be a different story. Fortunately for hockey fans, the new advertisements don't ruin the visual aspect of the game, and are allowing the league and all 31 franchises to make additional revenue. Zach Baru can be followed on Twiter @zbaru and reached at zachbaru@gmail.com. The 2018 NCAA Men's Basketball East Regional at TD Garden may not have had any local teams, but last weekend the venue included a lot more of the city than the previous time the tournament stopped in Boston. Actually, you could multiply the Boston influence by 23 times to be exact. That's because in 2012, the last time TD Garden was chosen to host the tournament, every professional championship banner had to be removed. 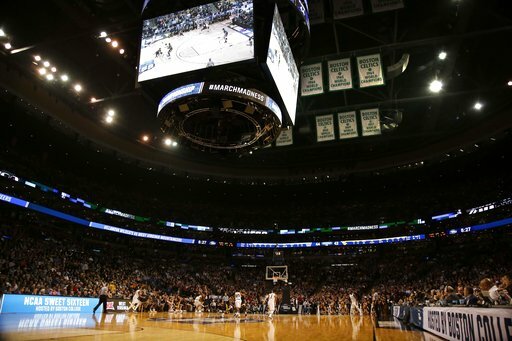 NCAA regulations forced TD Garden to remove the banners of professional teams. This was a little bit of a problem for a venue that is home to 6 Stanley Cup championships for the Bruins, and 17 World Championships for the Boston Celtics. Fortunately for Boston fans, in 2018 the NCAA allowed TD Garden to keep all championship banners for the Celtics and Bruins. Not only did this help out TD Garden staff enormously, who already had enough on their plate to ensure the venue was ready, but this also gave Boston fans and the estimated 8,000-10,000 visitors from out of town a chance to embrace in everything that is the tradition of Boston sports. Although the famed parquet floor was not allowed, or any other local floor throughout the tournament, at least the banners gave the tournament's stop in Boston a little bit of a local feel. Not to mention a small Boston College logo on the corner of the court, given to the school for being the host of the East Regional. The tournament also helped the city economically, and in impressive fashion. The two-night, three-game event last weekend was projected to bring in $25 million in economic impact, filling hotels, restaurants, shops and other establishments throughout the city. 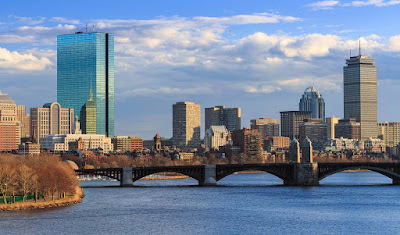 The NCAA Tournament provided a big economic boost for the city, a reminder to all sports fans worldwide that Boston can be a great host city, and an amazing weekend for basketball fans throughout the region. And yes, a reminder to all sports fans watching about the 23 titles that will forever live in The Garden. When the University of Massachusetts' football team faced the University of Maine on Saturday at Fenway Park in Boston, the temperature was 36 degrees with 12 mph winds, possibly leading to the low attendance of 12,794. 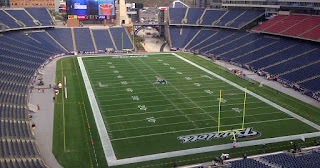 The game was part of the Fenway Gridiron Series, a five-game football series at Fenway including 3 college football games and two high school games between November 10 and November 22. 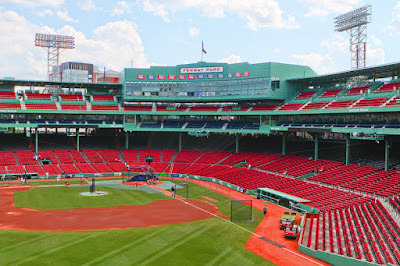 The series is promoted by Fenway Sports Management, and is yet another attempt to make Fenway Park more than just a baseball stadium for 82 regular season Red Sox games. 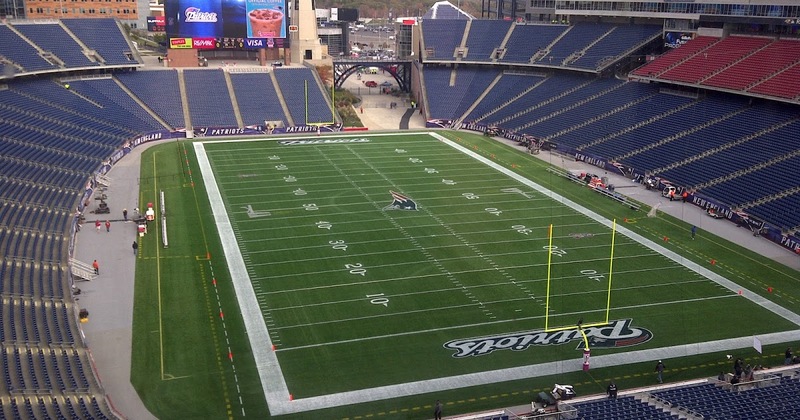 Year after year, Fenway has seen an increase in concerts and sporting events, as the Fenway Gridiron Series is an excellent way to make the venue a year-round destination for fans, just as Gillette Stadium and TD Garden is each year. The big question is, was the less-than anticipated attendance of 12,000-plus strictly because of the weather, or was it something else? 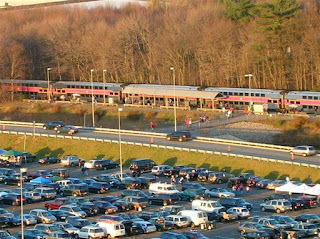 UMass for years has been trying to increase their presence throughout the eastern part of the state, playing games at Gillette Stadium and marketing themselves as a team for the entire state. Clearly the end result has been sub-par, as a game against a regional rival in a venue as special as Fenway Park should have had a much bigger crowd. 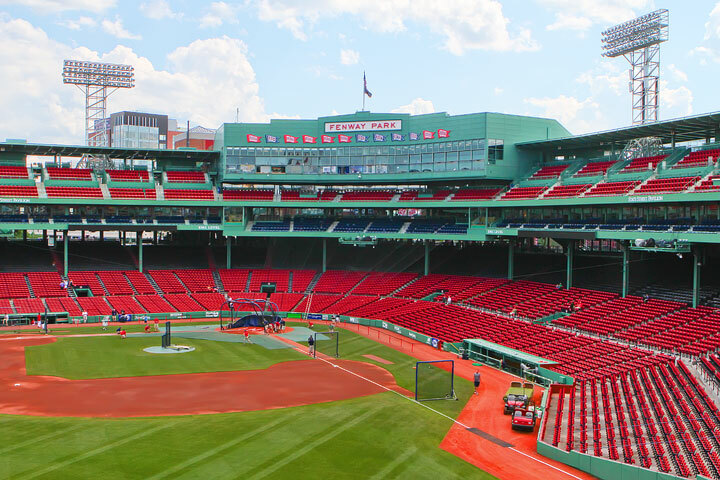 There has been talk about possibly having more UMass games at Fenway, and even a UMass lacrosse game at the ballpark as well. But with such a low attendance, the chances of more UMass games at Fenway seems questionable. If the windy, cold weather truly contributed to the lack of fans at Fenway, then possibly UMass Football could make a return visit. For UMass, the goal has long been to market more across the eastern part of the state, where more of the population and larger sponsors are located. Hopefully in the near future UMass sports can find a way to attract larger crowds in the Boston-area, which would only help promote and grow the UMass sports brand. July 2017 has been full of the wrong type of attention for the Red Sox when it comes to off-the-field news. Unfortunately for Boston's long-loved baseball club, one major trait has come into question in recent weeks - the character inside the clubhouse. Is this really a serious issue? When it comes to the bottom line, it certainly is. While in the long run this whole controversy could simply be just a slight drop in the popularity of the team, and potentially team revenues, the real issue at hand here is that any potential drop in popularity or revenues warrants concern. But how could public concerns over the "character"of members of the organization translate to a potential drop in revenue? The short-term answer is simple: ratings. The more the public has a negative opinion of the internal makeup of the organization, the more likely it will be that fans will elect not to watch the games, or at least until the issue is dealt with internally, thus pleasing the fans. Will all of this blow over? More than likely. But for now, this is a concern for fans, and should be a concern for the front office as well. Ratings are incredibly important in sports, and nothing in sports can be a better barometer for a teams' popularity. Which leads to the long-term affect of all of this mess - ticket sales. Unlike ratings, ticket sales is not always an exact barometer of a teams' popularity. Fans can obviously buy tickets far in advance and feel they need to use them, or simply be given tickets as a gift from friends or from businesses looking to entertain clients, potential clients or staff. Long-term, this wave of concern from fans could result in lower attendances, meaning potentially less concession, merchandise, parking and other revenues. In other words, make sure fans are happy, because professional sports is an industry full of domino effects. Fortunately for the Red Sox, they are part of a market where fan scrutiny is the very essence that makes the market so successful for sports teams. It is this passion that brings Boston teams off-the-field success year after year. So while Red Sox fans may be upset over the character within the clubhouse, it is this criticism that continuously makes for a unique, and successful market. It comes quicker and quicker each year. The 2017 Major League Baseball season is upon us, and with it comes a whole new list of challenges for the marketing department of the Boston Red Sox. While this is anything but a full list, here are a sliver of the issues the team will face in 2017 from a marketing standpoint. Issues from the recent success of other Boston teams, to a worldwide sports issue in the the ever-changing ways of society and the attention spans of young fans, to the criticism that has already begun from the media and fans about the teams' recent performance. For the Red Sox, marketing and public relations has historically been handled well, and is one of the franchise's best off-the-field assets. Every year brings something new to focus on, and shown from the attendance numbers and broadcast ratings, the team gets the job done. Sometimes we take for granted how hard it is to manage teams in the seventh largest media market, and arguably the top market in terms of on-field success in the last twenty years. 1. The competitive Boston sports landscape. The 2017 Red Sox season begins with the Patriots coming off a fifth Super Bowl win, in a market has long set the bar high for professional sports. Playoff appearances, division titles, or even league-leading records are practically meaningless to the high-standard Boston sports fan. And for good reason: in Boston, success is expected. Period. While the Celtics are not at the Patriots level of success, they are still on the upward swing, climbing towards the level of success that Boston sports fans expect. They are young, explosive, and exciting to watch. And most of all, they weren't expected to be where they are right now. Boston sports fans are hard working individuals that appreciate a team that works equally as hard as they do. The Celtics are just that, and enjoying an exciting 2016-17 season that is winding down shortly. For the Red Sox, the bar is just as high as it has ever been. Boston fans expect more than just a playoff appearance in 2017. This is the great part about being in a successful sports region. It makes the fans demand more, and forces the franchises themselves to strive for more. The question is, how will the Red Sox market themselves to promote that they are on the path to a successful season? The message needs to be sent out early to capture the interest of fans, especially during a potential Celtics playoff run in the coming months. The consequences could be a backseat in the Boston sports landscape. And with the MLB loosing their market share to other leagues within recent years, this is a risk the Red Sox cannot afford to take. 2. The decreasing attention-span of viewers. Ask any parent, teacher, or anyone who is frequently in contact with our youth, and they will tell you what is happening to society. It is a decreasing attention-span, and it is spreading to more than just the millennials. The ever-increasing option of instant gratification has been growing for years, and for baseball, is causing a huge problem for retaining viewers and fans. The Red Sox, like all other baseball teams, need to tackle this issue quickly. Football is full of ten second "highlight reel" plays, that capture the excitement of movie clips for sports fans. Collin Cowherd brought this up years ago, and it is something that is a major issue for all baseball teams. As popular as the Red Sox are, they are no different - they still have to win back the battle of their fans' attention, especially the young fans. Basketball and hockey have similar "highlight reel" flows to the game, and while baseball will always have home runs and diving catches, it is still a three-hour game in a world that now demands information in 140 characters or less. The question is simple: how can the Red Sox win back these fans? The answer, however, is not so simple. It will take extensive marketing, strategically crafted for young fans and fans who baseball is most at-risk for losing. Social media will be a key way of reaching these fans, but should not be the only focus. The fans that are turning away from baseball still watch plenty of television and listen to sports radio on a daily basis. The marketing campaigns need to reach these fans that are leaving the game, and prove to them that baseball is changing and is still worth watching. The longer baseball waits to tackle this issue, the further it will get from winning the battle. 3. Criticism from the media and fans. Criticism from the media and fans in Boston will be nothing new to the Red Sox. The bar for success is hard to debate - it is high in Boston. And no one will be feeling that more than John Farrell, who has already felt pressure from the media and fans. David Price continues to get criticism from both the fans and media alike, and Pablo Sandoval's contract has also generated some discussion, as he is in year 3 of his $95 million contract. But the criticism does not end there, leading to the question of how the Red Sox will send a message to the fans ensuring that they are heading in the right direction. Positivity will be key, and should be a focus for marketing this season. Fans need to be aware that this team is on the path to success. With good, positive marketing, the Red Sox can steer the conversation away from all of this criticism during the off-season. Unfortunately for the Red Sox, with the two aforementioned issues, criticism about the team really should not handled with belief that "any publicity is good publicity". The Red Sox, and all of Major League Baseball, has enough battles to face right now. On-going criticism about the team should not be looked at as a non-issue. The Red Sox front office may have a lot on its plate when it comes to marketing the team in 2017, but one thing is for sure, history tells us that they know how to handle it. They have one of the best marketing teams in not just present-day sport, but sports history. This is the same franchise that marketed "Paint the Town Red" back in 2003, and sold us on a group of guys that were counted out in 2013, and went on to become world champions. This is a franchise that knows how to market its product. And 2017 should not be any different. While Boston is home to some of the best on-field successes in the last 20 years, this region is also home to some of the best front offices the sports world has ever seen.